HOW FAR CAN YOU GO IN A DAY? 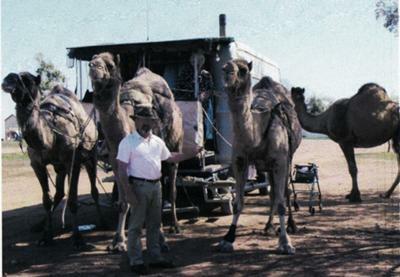 When Bob Sargeant and his partner Dawn Wiles became fed up with the craziness of modern day living away back in 1987, they did something very few of us would dare to do – they sold all they possessed, purchased four ex wild camels, converted an old caravan into a wagon, broke the camels into harness and headed off into the sunset. Over the next 22 years their travelling plant grew to seven camels, one wagon, a small wagonette, five dogs and a cat. They faced hardship, floods, drought and "people who should know better". They travelled over 65,000 kilometres throughout the western areas of eastern Australia, and made two packsaddle journeys totalling 15 months and 4,000 kilometres. Along the way they lived almost entirely off the proceeds of camel rides put on in outback towns and villages they passed through, or a "few bob" they managed to pick from a day or so's work here and there. Their story is one of endurance, laughter and sadness, laced with the humorous meetings with a mishmash of outback characters the like of which are now fast disappearing. Both Bob and dawn have just turned 70 and have finally retired. Over the past five years Bob has called on his diaries and applied himself to chronicling their life on the track (some of which was written "under a tree" as they travelled). The result is "How far can you go in a day?" books one and two, and "There's some humps on the track", over 600 pages of text, photographs, illustrations and with a glossary of Australian terms to assist people unfamiliar with Australian idioms. There are also two appendixes detailing how they went about setting up their wagon and harness systems, and also includes helpful observations on some plants found in eastern Australia that camels will and won't eat. These books are absorbing reading, interesting, factual, very well written by a man whose formal education "couldn’t compete with better things on offer at the time", pull no punches when it comes to social comment and are awash with out loud laughter moments. At just $35.00, this CD is a must for anyone with a yearning for adventure and reading about just what can be achieved when we're prepared to step outside the square. Where can I get a hold of the book or CD? The books are available from Bob and Dawn, just ring 0427 2280-79. Thanks for the laughs and the education Bob, I've enjoyed it heaps.